Spectators Hiss Jack O'Brien and Joe Choynski and Cry "Fake"
Something looked funny in the Washington Sporting Club's ring on this day in 1903 - and the fans let both fighters know how they felt. 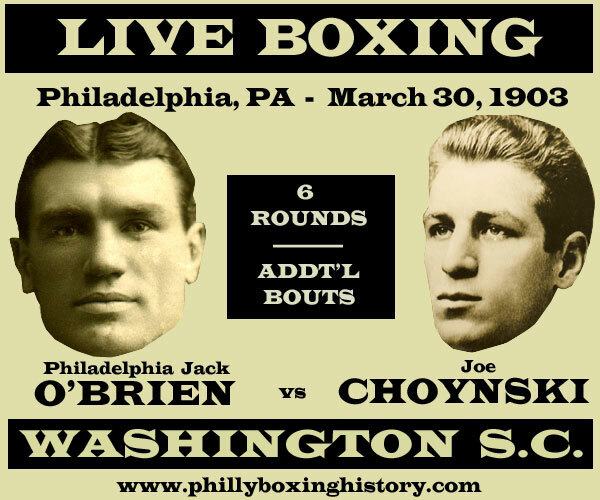 For almost the first four rounds of the six-round contest between Philadelphia Jack O'Brien and Joe Choynski everything seemed to be on the up-and-up. Both fighters fought to win which delighted the large crowd that braved a terrible storm to attend the match held in North Philly at Broad & Wood Streets. However, according to the newspaper reports of the day, starting sometime in the 4th round, Choynski seemed to start pulling his punches and not jumping on apparent openings that could have helped him turn the fight in his favor. Such odd behavior from a true boxing warrior like Choynski made the audience think that Joe and Philly Jack had made an agreement as to the way the fight would play out. So they "hissed" their displeasure toward the ring. In the following round, Choynski stopped punching altogether while O'Brien threw his blows with less than dangerous intent. With thundering volume, the crowd blasted the "combatants" with a chorus of boos that told the fighters they weren't fooling them. The referee stepped in to warn both boxers. The ref's cautions continued in the sixth and final round, without much affect on the action. After each warning, Choynski would pick up the pace for a few moments only to return to his passive ways. All the while, O'Brien continued to punch without conviction. He used his speed and agility to control the action. After the sixth round ended, the crowd gave one final noisy opinion as the fighters briskly left the ring and returned to the dressing room.